New Year celebration in Iran, one of the oldest in the world, are distinguished from some aspects with the other similar ceremonies in the world. For many people the timing of the New Year is of importance. The New Year is exactly in accordance with the spring equinox, which symbolizes the end of the gloom and coldness of winter. Welcoming the spring, which heralds a new era of prosperity. The expression ‘Nowruz’, which Iranian use for this day, means ‘the new day’ and that is the reason that the related ceremonies too are of importance to Iranians, they are symbols of change. In old times people believed that, the combination of four main elements has formed the nature: fire, soil, water, and air. Among ancient Iranians, the fire had a specific place and was respected, due to its purifying character and the fact that it never gets polluted. The New Year celebration starts with the ‘Feast of fire’, which in Persian is called ‘Chaharshanbe Suri’, during which people set up the fire and leap over it. As they people leap over fire they sing songs in which they call on the purity of fire, eradicating the impurities in it. ‘Feast of Fire’ is a deep-rooted, beautiful ceremony, at the right time of a natural change. It must be cherished because it strengthens the solidarity and affection among the Iranian nation. But since the anti-monarchy revolution took place the ‘Feast of Fire’ changed face too, taking a step forward as a tool for confronting the mullahs’ dictatorship. In 1979, after Khomeini hijacked the leadership of the anti-monarchy revolution of the Iranian people, he found the pure Iranian national culture in contradiction to his reactionary ideology. He looked at it as a hurdle, hindering him form establishing his desired political system based on his own fundamentalist thoughts. Therefore, from the onset, Khomeini and other clergymen close to him took an anti-nationalism stance, tried to eradicate the ceremonies of Nowruz and particularly the ‘Feast of Fire’. To do that, the clerical tyranny ran a vast campaign against all the symbols of the Iranian national culture and Khomeini blatantly stated: “There is a conflict of interest between nationalism and Islam (read regime’s fake presentation of Islam)”. Following Khomeini, many other reactionary mullahs, like Morteza Motahhari, ruled against national festivals, particularly the ‘Feast of Fire’. They brazenly used labels such as heathen, superstitious or even stupid regarding the people who were loyal to their glorious and proud culture. People not only did not take a blind bit of notice to the Mullahs but instead attempted to take advantage of the pure national Iranian culture as a strong mean to defeat mullahs ideologically and politically. In this way, for years, New Year festivals, have become one of the gravest challenges for the tyrannical regime ruling Iran, and the ‘Feast of Fire’, has a remarkable place in this challenge. 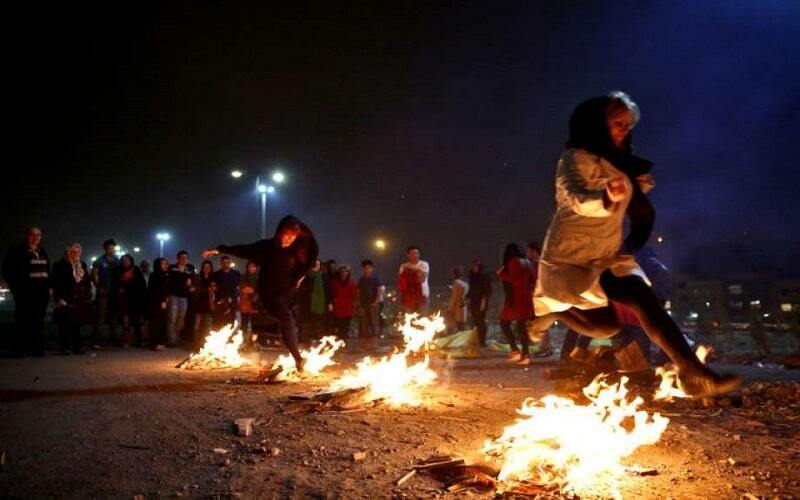 ‘Feast of Fire’ is a ceremony that, due to the literally fiery content of it, has always been an appropriate bedrock for national solidarity and uprisings and has rapidly turned to an opportunity for the people to express their hatred toward the dictatorial regime of Iran and its repressive forces, especially by the young people. The Regime’s officials admit that on each ‘Feast of Fire’ celebration, streets and squares of every city and town turn to battlefields, and that, in spite of all the security forces that are on the Full Alert. Yet, this coming New Year’s ‘Feast of Fire’ is more different from those in the past and the regime is worried about the flames of the uprising it embeds, more than before. The regime is worried about a potential danger, this year, because of more-than-a-year ceaseless uprisings and protests nation-wide. Mullahs are fearful and feel a real and perceptible danger. They are well aware of the call for protest and uprising at ‘Feast of Fire’ by the MEK/PMOI headquarter inside Iran (MEK or the People’s Mojahedin Organization of Iran is the core organization of NCRI or National Council of Resistance of Iran, the coalition of anti-regime forces). In other words, members of the “Resistance Units,” a network associated to the Iranian opposition, the PMOI/MEK, are escalating their measures by directly targeting the regime’s oppressive icons such as setting fire to the entrance of a Revolutionary Guards (IRGC) or Basij base, and the images of regime founder Ruhollah Khomeini and its current Supreme Leader Ali Khamenei, putting the Iran’s regime in a state of fear more than ever.